When we moved to the new house, Alex accidentally left part of the grill in the back yard. We had to get a new one. We've been looking around at grills and none have really been that interesting to me, except this one. A smoker. It was cheap (we got it for less than $60) and can double as a grill, which is what sold Alex. My mom has a smoker, and every time we go home she smokes food for dinner. It's SO cool. After debating long and hard at the hardware store, we settled on it. And man, am I glad we did! We got a duck from the Asian market and planned to smoke it yesterday. I fired up the smoker, Put in the duck, then realized that I was using an awful lot of charcoal for such a small thing.... so I ran to the grocery store and grabbed some cheap cuts of meat. A slab of pork ribs (which I rubbed with BBQ sauce), a chunk of country style boneless pork ribs (which I rubbed with paprika, salt, pepper and a little sugar) and a chicken (which I quartered and seasoned with some weird BBQ spice I found in the cabinet). I tossed them all in the smoker and spent the whole rest of the day trying not to open the smoker, and staying away from the yard because it smelled SO GOOD. Oh man. Finally it was time, I opened up the smoker and everything was done. The ribs were a little over cooked, because I hadn't read the directions about how long they needed right, but everything else was perfect. I pulled the boneless pork and mixed it with BBQ sauce, shredded the duck, made a gravy from the smoking liquid (all the juices that had run out of the meat when it was smoking for 6 hours), and we dug in. It was well worth it. All of Alexs friends are jealous, we have enough meat to eat for a week, so now all we have to cook is vegetables. YUM. Anyway, I've also been really into cookies. I have a great cookbook by Nigella Lawson, Nigella Express, and this recipe is adapted from there. I would recommend eating these cookies warm, with a little ice cream and caramel sauce or hot fudge. Melt the 4oz chocolate in the microwave, 20 seconds at a time. Preheat the oven to 325. Mix all the dry ingredients. Cream the butter and sugar, then add egg and vanilla. Mix with the dry ingredients, add chips, and drop by large (1/4 c) blobs onto a greased cookie sheet. Bake 16 minutes. Makes about a dozen. Jill I miss your delicious cooking. 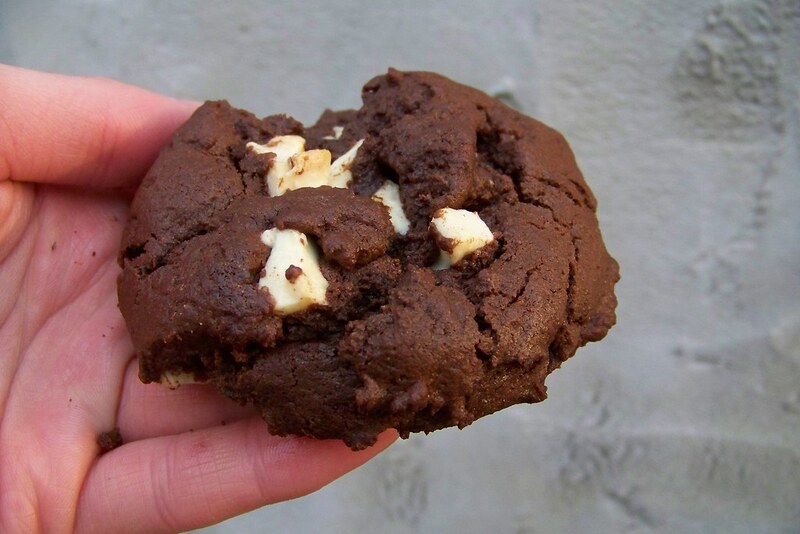 That cookie looks heavenly. Hope you have fun on vacation, we should hang out when you get back. Tell Alex hi. 14e i miss you!!! You have to come visit when we come back. 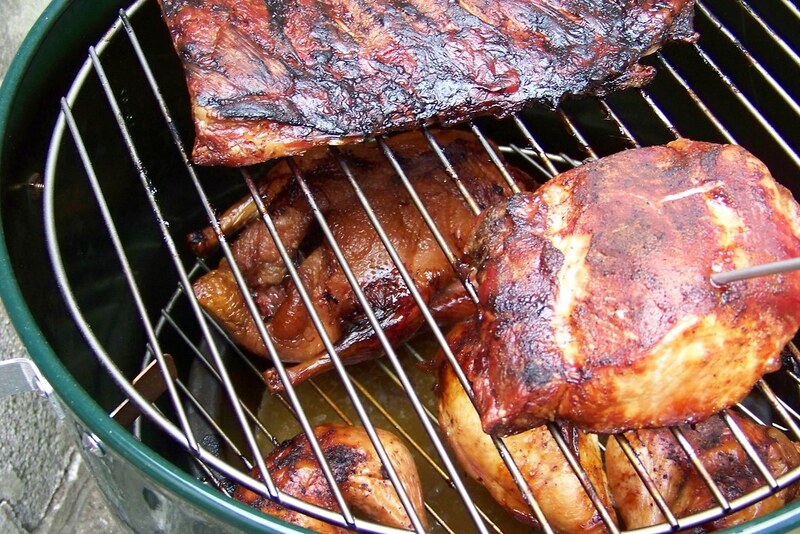 jacobi- Smokers are grills that instead of cooking the meat quickly wish a charcoally taste cook it slowly (like 6 hours) and with the addition of wood chips of different trees give different delicious flavors. Mine doubles as a grill for when I want instant gratification, though!